TIC Americas 2019, an opportunity for young entrepreneurs! Washington D.C., September 20, 2018 - The growing community of young entrepreneurs will be able to access new tools and support networks, following the launch of the XIV Edition of the Talent and Innovation Competition of the Americas (TIC Americas 2019) by the Young Americas Business Trust (YABT) and the Organization of American States (OAS). The call is open to entrepreneurs between 18 and 34 years old, who are citizens ofMember States of the OAS. The participants will have the opportunity to present their idea or project, in innovative solutions that improve the quality of life of the communities, on the international stage. It is not necessary to have a business plan when registering since YABT grants platforms and business resources for the formation, acceleration, and consolidation of your business plan; in order, to make it sustainable and scalable. Startup Challenge seeks the development of innovative solutions developed by young entrepreneurs, who propose productive models with a positive impact on the implementation of the Sustainable Development Goals. Startup Challenge promotes and supports the consolidation of fast-growing enterprises in the financial, trade, agriculture, health, manufacturing, education, energy, and other sectors. Eco-Challenge 10.0 seeks the development of innovative solutions developed by young people that allow the improvement of the quality of life of people through a tripartite approach divided into Nutrition, Environment, and Women. 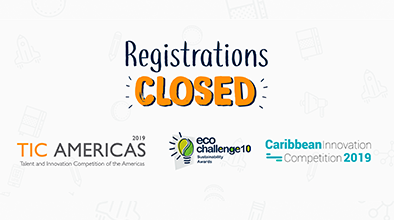 Eco Challenge 10.0 is the result of an alliance between PepsiCo and YABT, with the support of the OAS, in order to promote sustainable innovation empowering young people as agents of change in their communities. This edition seeks to recognize all those business solutions that identify and provide innovative, sustainable and viable business solutions to reduce the impact of the industry on the environment. Caribbean Innovation Competition (CIC), seeks the development of innovative solutions and commercial proposals developed by young entrepreneurs, that address the most pressing challenges and aimed at turning the Caribbean into a sustainable region, with economic opportunities in potential sectors of their economies. TIC Americas and Eco-Reto have consolidated as hemispheric platforms to provide support and acceleration to entrepreneurship while reinforcing local initiatives to support young people. These platforms offer virtual training, business resources, mentoring, and strategic connections. January 31, 2019, is the deadline for registration and delivery of the documents and materials of each category. Teamsmeeting these requirements will be evaluated by a selected international panel of judges. The Finals will take place in June 2019, within the framework of the 49th General Assembly of the OAS, to be held in Colombia. In the last 13 editions, TIC Americas has had a total impact on 45,109 young entrepreneurs from 48 countries, presenting 24,232 proposals. This is how TIC Americas is positioned as one of the best support and acceleration programs for young entrepreneurs in the Western Hemisphere. 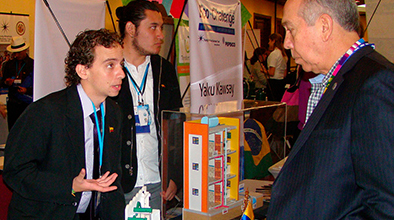 Since 2009, YABT, in partnership with PepsiCo Latin America Beverages, has incorporated the Eco-Challenge, as a special category of environmental innovation within TIC Americas; thus, this program supports the development of business projects or ideas that promote sustainable development in the Western Hemisphere. To date, the Eco-Challenge has received 13,048 proposals, submitted by 15,935 young people from 35 countries. With 6 editions, the Caribbean Innovation Competition has had an impact in 20 countries with 1,373 young people who have presented 1,182 innovation proposals for the Caribbean with the objectives of sustainable development. Young Americas Business Trust (YABT) is an international non-profit organization, founded in 1999, working in cooperation with the General Secretariat of the Organization of American States (OAS), supporting its objectives and the mandates of the Summit of the Americas, to develop and implement programs and activities that foster entrepreneurship, innovation and youth leadership in the Americas - focuses on combating poverty and creating more opportunities for young people, and involve young people in the implementation of the United Nations Sustainable Development Goals.